Our church supports the Barcelona branch of Salvation Army through regular food donations. They serve breakfast every day to around 100 people, and distribute bags of groceries each week to families in need. 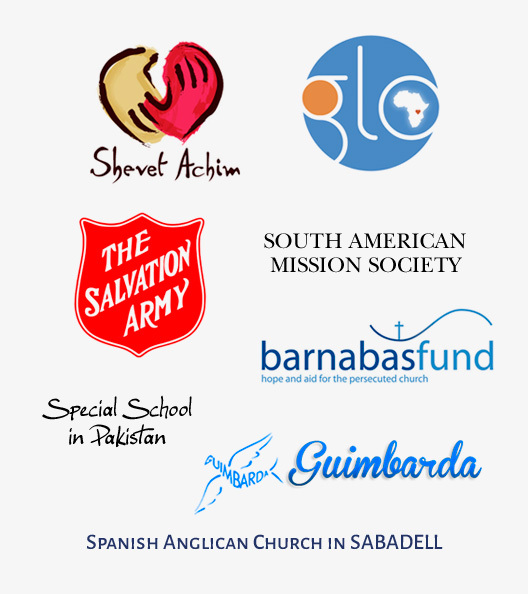 This is a service of providing second-hand clothes to needy families through the Spanish Anglican church in Sabadell. Donations are accepted at St George’s year round and delivered to Sabadell on a regular basis. Special education centre in Barcelona for children with learning disabilities and special needs. Helps people in Burundi overcome war trauma by providing humanitarian aid, funding sustainable projects and bringing God’s message of peace, hope and love. Through a personal connection at St George’s, we help to support the work of Pilar Vila-San Juan, a nun from Jesus & Mary Convent, working with disabled children at a special school in Pakistan. Provides aid and prayer support to strengthen and encourage the Church in parts of the world where Christians face discrimination or persecution for practicing their faith or converting religion. Proclamation of the Gospel of Christ in word and works between the churches of South America, Spain and Portugal, and other churches of the Anglican Communion. Children’s hospital in Israel helping non-Israeli children receive lifesaving medical care.